As the flakes of snow bluster sideways, carried on the bonechilling wind outside the library here in Hartland, the old boiler cannot quite keep up with the demands this drafty building puts upon it. Watching the hunched-over, bundled up passers-by on the sidewalk below, with their scarves over their faces, hats smushed down as far as possible against the wind, I am having difficulty believing it’s time to order the seeds for my garden. Soon, I’ll need to get the starter tables and lights set up in the basement. It doesn’t seem possible. Buried in the back of the freezer lies a box full of last years unused seeds, which will need to be augmented by a modest refresher order. Last year, the seeds were about $300. This year, it will be less than half that, unless I am wildly underestimating. Janet, my awesome step-mom, sent me a link to a great site I’d long forgotten, You Grow Girl. Her current post briefly touches upon Monsanto and Genetically Modified Organisms (GMO’s,) and has a link to this page: How to Avoid GMO/Monsanto. 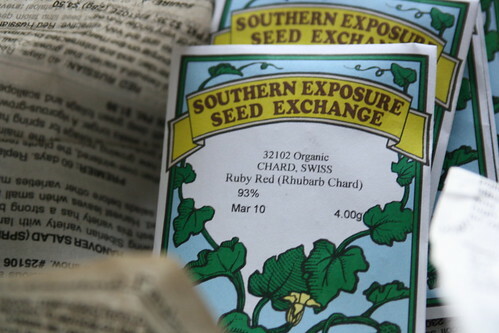 I am sad to see my seed supplier, Southern Exposure, has not signed the Safe Seed Pledge. 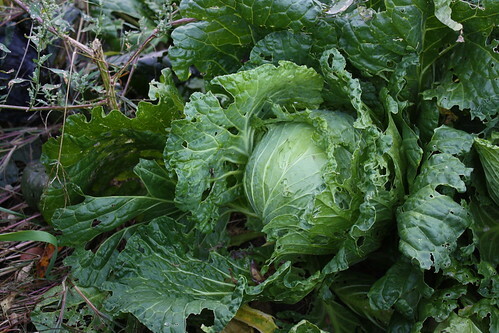 I will probably source my garden elsewhere this year because of that simple thing. They are not on the “to avoid” list, but I’d like to support a company who actively does not participate in GMO programs, and who is committed to that cause. After my (completely overwhelming) garden-related successes last year, most people I knew assumed I would scale things back, size-wise. 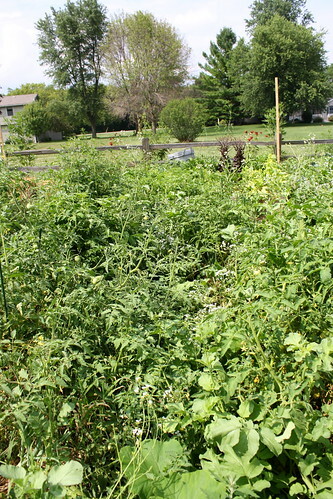 In truth, I’d actually like a larger garden plot to better space things out. 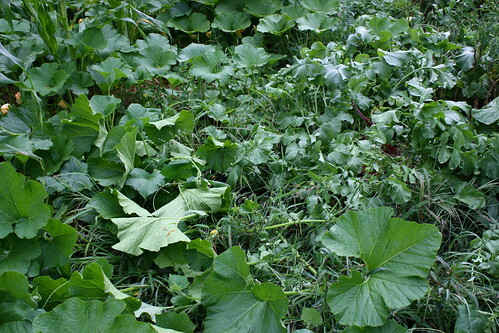 The vining plants overran everything like kudzu; they were impossible to keep up with, and putting them elsewhere would be a good step. What else will I do differently? Alternately, I will put the tomatoes in buckets and hang them upside-down… although I am concerned about the root growth in that kind of environment. 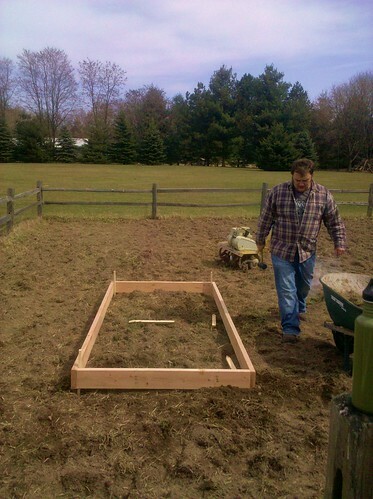 I will build more raised beds, and with luck, Mike Neir will help me. 🙂 The raised beds made life a lot simpler. Some plants will not fare well in raised beds, and others are simply too big to be worth the space investment. We will design a better watering system – one that does not destroy fragile plants by requiring hoses to be dragged all over hell and gone. It will be raised off the ground for farther and more even coverage. It will, to some degree, be automated. I will plant fewer tomatoes, cucumbers, peppers, pumpkins and squash. 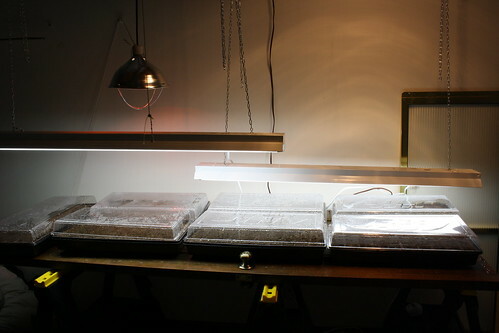 I will plan sequential plantings and harvests, thereby reducing the overabundance of lettuces one month and a complete dearth the next. I will continue adding native plants to help feed the bees and hummingbirds, as well as to make things look natural. Ideally, I’d like to convert giant swaths of our yard to natural flowerbeds, much like Dad and Janet have done over the years. I will use the amazing landscaping fabric between rows. The stuff is incredible. Where I used it this year, absolutely zero weeds grew. Straw underneath will be optional, but good for the soil if I manage to do both. 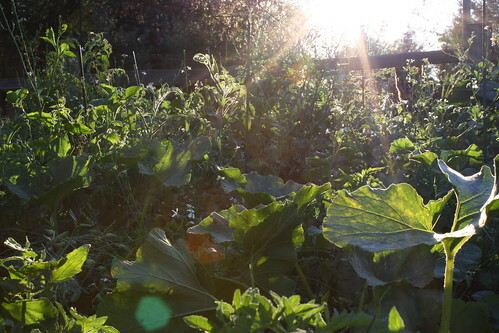 Straw alone is better than nothing at all, but weeds and grass do poke through and can become problematic. The fabric allows no shenanigans. Every place the fabric was not – crab grass was. 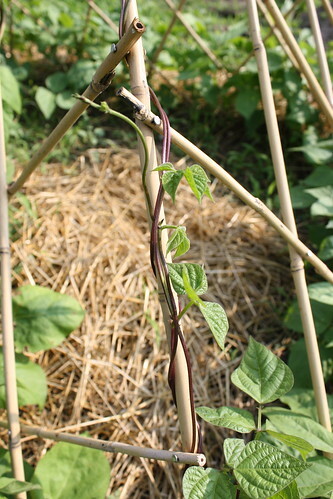 I will put fabric underneath the trellises, where it is impossible to weed after placement. Straw alone was not sufficient weed deterrent. I will not leave any tools stabby-side-up. In fact, I will probably get a small storage device out there so I don’t have to carry everything hither and yon. Three hundred feet may not seem like much of a walk, but when making mulitple trips carrying armloads of tools… it wears on a person. I will be less concerned with planting companion crops. Last year, I spent literally hours mapping out which plants would go near each other, taking absolute care never to plant “enemies” next to each other. Last year, each tomato plant had an onion and/or radish companion. The radishes grew to the size of small hams and went unused. 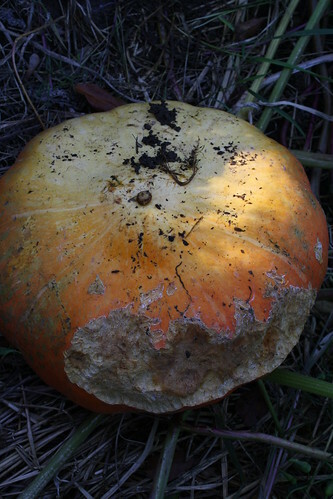 The bugs didn’t do a vast amount of damage to the tomatoes – that was the shrew. Other companions sets were obliterated by Japanese beetles and their ilk. We’ll see how it goes this year. 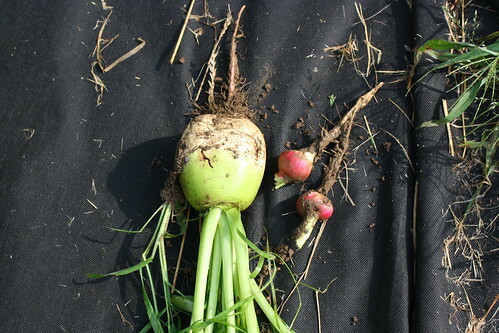 Two normal radishes, 1 giant mutant radish. Speaking of my little brown rodent friends, I will be placing live traps this year. That little sucker (or suckers) got well over half my tomato and pumpkin yield, and was particularly partial to the large, heirloom varieties. I will put up Japanese beetle traps again this year, too. 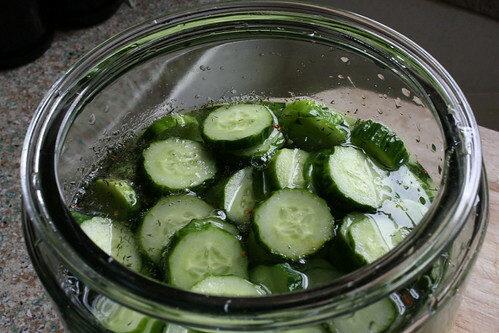 I will learn how to preserve more of the harvest. So much went to waste last year. Everything I stored in the garage (cabbage, potatoes, pumpkins, squash) rotted. There was simply too much freezing/thawing going on, and everything collapsed. It has been a brutally cold winter here in Michigan, punctuated by peculiar warm patches (sixty degrees on New Year’s Day, for example.) Somewhere in the basement, a proper root cellar will be born. There’s a ton of stuff in the freezer I need to start using, to get the space ready for the coming year’s harvest. Many things rotted on the vine. It was a complete waste of time, effort and resources. I will let Mom help. Mom loves weeding and tending to plants. Since we’ll be having nothing but time together, I will permit her to be at our house and to help me in the garden. Those of you who read last year might remember how much I love to weed (ahem,) so it’s not as if letting Mom do some of it will be a problem. It will get her out of the house, outside and will help me with one of my most odious tasks. We’re going to need things to keep each other occupied. 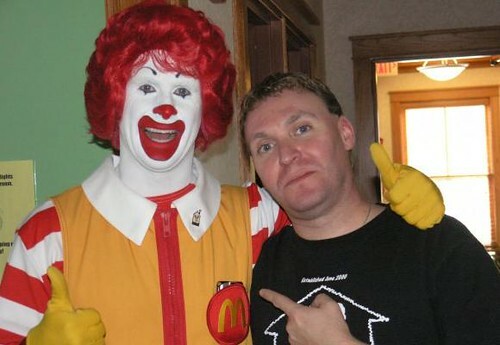 When I have an overabundance, I will donate more to local programs, like the Ronald McDonald House. My friend Josh volunteers a huge amount of his time there, and says they are having a very difficult time feeding the families staying with them. 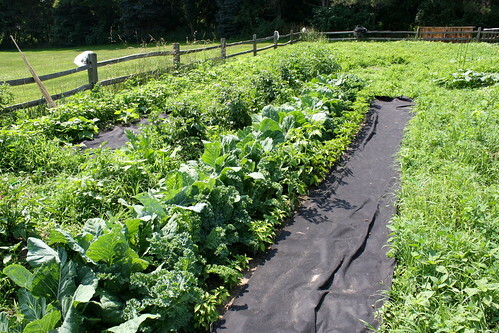 Last year, I took kale, collards, squash and some other things over a few times. I could have done more, and I will this year. The months of sweat and toil seem long-gone now, and I have probably forgotten how difficult a large garden can be – how time-consuming and exhausting. But in the end, it’s worth it. 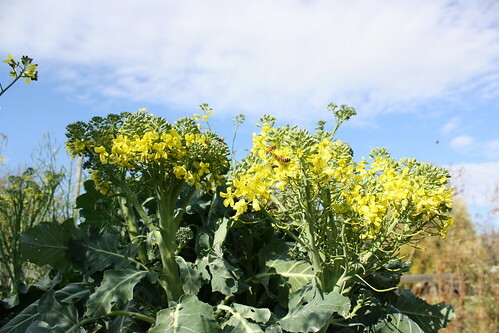 Regarding seeds, have you ever heard of Baker Creek seeds? They are exclusively heirloom. I get most of my seeds these days from Fedco & Johnny’s, not least because they’re Maine companies. Fedco, in particular, works a lot with Maine Organic Farmers & Growers Assoc. 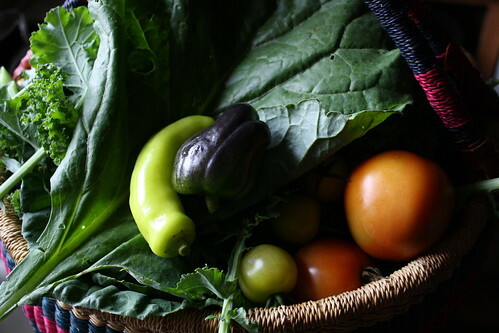 to preserve heirloom varieties and they always note the origin of the seeds they sell. If you’re looking for a tasty way to preserve some of your produce, there are several good kimchi recipes on-line. I buy from Renee’s Garden and Seed Savers Exchange. I am going to have a bitchin’ garden this year! And I want to try the upsidedown tomatoes too! Heather – Thanks for those links! Mel – Thanks for that company name, too!